SemiAccurate keeps saying Thunderbolt is dumb, expensive, and anti-user, but we do so with good reason. Part 37 to this rant is simple enough, yet another existing product that actually does the job Thunderbolt claims to, but doesn’t actively hurt buyers. The product, or line of products, are external PCIe cables from IOI Technology Corporation. You probably have never heard of IOI because their focus seems to be on the industrial side of computing, factory floor, mobile, and embedded things that require reliability and durability. The cables, adapters, and boxes we saw at Computex were big, heavy, and sturdy. For a home user, that isn’t a good idea, especially in light of added costs for things like retention screws, but for those who want things not to break, it is a necessity. For that crowd, IOI makes some really nice products. Before you run for the hills, there is no reason you can’t make it cheap, pretty, and (relatively) unreliable, after all, people buy HP laptops all the time. What are we blathering about? If you recall, Thunderbolt doesn’t actually do what it says, it is only half as fast as claimed. On top of that, it doesn’t actually support the bandwidth necessary for the intended target market, vain video editors, and that’s before you try and push data I/O over it too. Basically, Thunderbolt may be a sham, but it is expensive, and hurts the consumer by locking them in. Instead of going with a cheaper industry standard, external PCIe, Intel is doing its best to sink that spec. Why? Because they can’t use it to extort money from the entire computing ecosystem, and brutally shut out competition. Think there is a reason that, for the same bandwidth, a USB3 chip costs <$2 and a Thunderbolt controller is ~$20? Think there is a reason you can get USB3 chips from a lot of manufacturers, but only one can and will ever be allowed to make Thunderbolt chips? Think there is a reason that external PCIe cards, cables, and devices are readily available, but you haven’t heard of them? We won’t point the finger at anyone in particular, but the silence is an actively achieved state. That said, IOI makes some cool things, like, oh, external PCIe cables, adaptors, and breakout boxes. The version pictured above is a PCIe2 4x external adaptor, cable, and breakout box with four PCIe2 1x slots. A Thunderbolt lane has 10Gbps of bandwidth, usually with two lanes per cable, and can supply 10W. PCIe2 4x has 20Gbps, and can supply 75W per slot in theory. Thunderbolt tunnels up to two PCIe2 lanes per TB lane, so it is likely higher latency than raw PCIe2 4x as well. The rig you see above is clunky, rugged, and far from pretty, exactly what you would expect from an industrial computing product. It is also an industry standard, has no lock-ins, and doesn’t give any one company a lever to essentially extort the industry with. External PCIe is better than Thunderbolt in every way, period. Need more than 10Gbps? With Thunderbolt, you can have 20Gbps, but not until 2014. If anyone still cares about Thunderbolt by then. 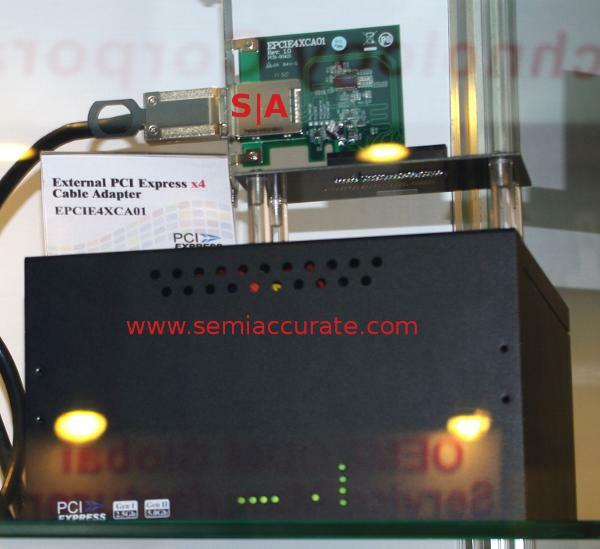 With external PCIe2, you can buy it now, off the shelf. Yes, 40Gbps, 2m cables, and 75W of power, all available in quantity from IOI. Among others. The one pictured above uses two 4x cables, but IOI also has 8x lanes in a single cable should you prefer that. While this version is low volume and overbuilt for reliability, with minor effort, you could make a consumer variant that is pretty, not clunky, and more reliable than anything you can buy at Best Buy. The technological hurdles are non-existent, it is an available product, and the cards are simply mechanical breakout devices, so no worries on cost there. It is better in every way than Thunderbolt. Laptop use you say? Thunderbolt works there. 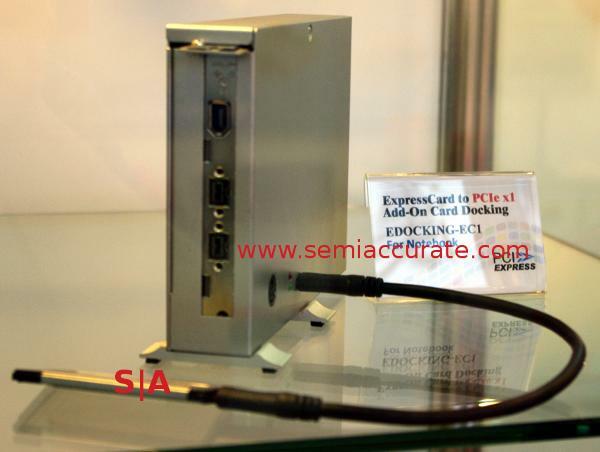 So does external PCIe, in this case, an ExpressCard to an external box with a PCIe 1x slot. 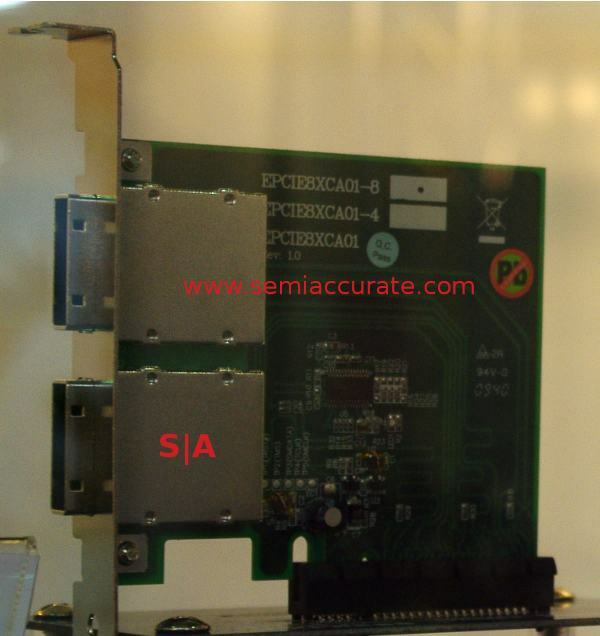 This one is not PCIe2 or >1x because one PCIe 1x lane is all ExpressCard slots can deliver. That said, there is no reason you can’t route a 16x PCIe2 signal to an external port for the cost of a few mobo traces and jack. AMD did an 8x version several years ago, and it worked really well. Once again, standard, available, and better in every way than Thunderbolt. IOI Technology isn’t stuck on external PCIe though, they do other cool stuff as well. You can see some of it here, but take a look at the USB3 cable above, it is not one but two USB3 lanes. As soon as IOI comes out with a USB3 PD capable version, you can have the same 10Gbps bandwidth as Thunderbolt, but 10x the wattage. For far far less money. And no lock in. What’s not to like?